In the following article, Janie L. Hendrix, President and CEO of Experience Hendrix and the younger sister of music legend Jimi Hendrix, reflects on the lives of their grandparents, Bertram Philander Ross Hendrix and Zenora Moore. Her article reminds us of the rich entertainment heritage dating back to the beginning of the 20th Century that Jimi Hendrix drew upon when he eventually became one of the most famous and successful Rock musicians of all time. As I reflect on the origins of the Hendrix family, it is with a sense of warmth and appreciation for those who laid the foundations that we have built upon. Ours is a rich heritage, filled with intrigue and energy. Although Jimi is the most widely known member of the family, he was not the only Hendrix with artistic talents. The blood of entertainers coursed through his veins, originating with his grandparents, Bertram Philander Ross Hendrix and Zenora Moore. To paint this colorful picture, let me take you back to the small town of Urbana, Ohio. The year is 1866. Fanny Hendricks and Bertran Philander Ross gave birth to a son who would be the grandfather of a legend. Fanny Hendricks lived on the property of Bertran Philander Ross, a prominent Caucasian grain dealer who was also one of the wealthiest landowners in Urbana. This post-Civil War era was one of great struggles for African Americans. Prior to her union with Bertram, Fanny Hendricks, having recently ended her marriage to Jefferson Hendricks, was a single parent seeking work. The elder Bertram had previously been married as well. The exact details of Bertram’s and Fanny’s relations remain unknown; however there is speculation that Fanny may have worked in the grain mill owned by Bertram. Fanny gave the newborn the first name of his father, possibly to ensure that the community would know the lineage of her child. Those of mixed race or African American heritage faced obstacles in Urbana. For this reason, Ross Hendricks left his place of birth and migrated to Chicago in 1896, hoping to forge a new path to opportunity. Ross changed his last name from Hendricks to Hendrix in Chicago and briefly married. Life in Chicago proved to be more promising and Ross made a name for himself as a special police officer. The pulse of entertainment and adventure beating in his spirit, Ross quit the police force and joined a traveling vaudeville troupe. His work as a stagehand took him all over the country until the troupe broke up while in Seattle, Washington in 1912. Zenora “Nora” Moore, Jimi’s grandmother, was born on November 19, 1883 in Georgia to Fanny Moore, originally from Ohio, and Robert Moore Sr., a Georgia native. Fanny Moore was half Cherokee and half African American. Robert Moore Sr. was a freed slave. Together they worked to make a life for their family, relocating to Tennessee, where Nora was raised. By the beginning of the 20th Century, Nora, now a teenager, noticed the growing popularity of touring vaudeville acts and immediately took an interest in this form of entertainment. She thoroughly enjoyed the music, dancing, comedy routines and the excitement of the stage. By her early twenties she began performing. Along with her sister, whose stage name was Belle Lamar, Nora joined a traveling vaudeville group as a chorus girl/dancer. For the next several years, Nora and Belle toured the country as part of this lively body of entertainers who quickly became known for their extravagant costumes. 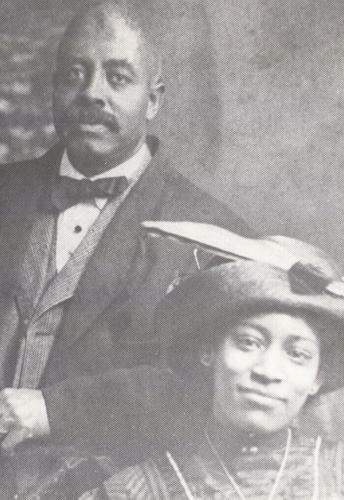 Nora Moore and Bertram Philander Ross Hendrix met on the road. The two found themselves traveling around the country together as part of the same Dixieland vaudeville troupe. Their troupe included six band members plus a cast of seventeen actors, comedians, and dancers as well as stagehands such as Ross Hendrix. As Nora performed her act onstage, a bond was developing offstage between the entertainer and the stage hand. As the tour began to concentrate in the Pacific Northwest with the entertainers often traveling between Portland, Oregon and Seattle, Washington, both Nora and Ross began to view the area as a permanent home. Financial difficulties brought the tour to an end in Seattle in 1912, but that end proved to be the beginning of a new life for Ross and Nora as they decided to marry in that city. Non-stage work, however, soon proved difficult to obtain in Seattle. On the advice of an acquaintance known only as Mr. Cohen, Ross and Nora Hendrix moved to Vancouver, British Columbia where he would find work. Cohen recommended Ross to a friend who was affiliated with The American Club in Vancouver. Ross obtained employment there. With employment, Ross and Nora started a new family and a new life. All four of their children were born in Canada. Nora gave birth to the couple’s first son, Leon Marshall Hendrix, on April 12, 1912 (he passed away in March 1932). A daughter, Patricia Rose Hendrix, was born on May 3, 1914 and a few years later, two more sons, Frank Hendrix on October 3, 1917 and James Allen Ross Hendrix on June 10, 1919, were born. James Allen (“Al”) Ross Hendrix would later become the father of Jimi Hendrix who was born in Seattle on November 27, 1942. A fifth child, Orville Ronald Hendrix, was born on January 25, 1926, but passed away two months later on March 31, 1926. Finding Vancouver to be a comfortable place to work and raise their four children, Ross petitioned the Canadian Government to become a Canadian citizen. On November 28, 1922, Ross and Nora Hendrix were officially naturalized and became Canadian citizens. Ross also became very active in Vancouver’s Fountain Chapel, the local African Methodist Episcopal (AME) Church. Being a “people person,” he enjoyed his work as a steward in some of Vancouver’s most prestigious clubs including the American Club and the Transportation Club of Vancouver. In 1925 he accepted the position of first porter at the newly opened Quilchena Golf & Country Club which was located in one of the most posh neighborhoods on the outskirts of Vancouver. Ross held this position at Quilchena until March 21, 1934, when he passed away because of a ruptured aorta. Following the death of their father, the Hendrix children went in separate directions. James “Al” Hendrix, the youngest child, performed several odd jobs in Vancouver and in Victoria on neighboring Vancouver Island. Al also became a fierce competitor in the boxing ring, even participating in a Golden Gloves boxing event in Seattle in 1936. In addition to the fights, Al shared his parents’ love of music and dancing and regularly participated in some of the city’s jitterbugging contests. Ambition would eventually drive him to permanently relocate in Seattle, Washington for work in 1940. His mother, Nora Hendrix, remained in Vancouver for several decades, moving to Seattle in the 1980s with her son Al Hendrix and family. She later returned to Canada where she lived until her passing due to cancer on July 24, 1984 at the age of 100. Jimi Hendrix’s career was clearly influenced by his grandparents and particularly his grandmother, Nora. Although Nora and Jimi performed in vastly different musical eras, they were united by their love of entertainment, their penchant for flamboyant costumes, their desire to perfect their talents, and their dedication to their audiences despite the trials of performing on the road. The roots of Jimi Hendrix’s enormous success lie in the blood of his vaudevillian grandparents, Nora and Ross Hendrix.